20 months: Big Boy Bed, Photos Galore & More! Rex is 20 months! And if you read one of my recent posts, you might know that I’m treading water and barely keeping my head above, so please forgive that this won’t be as robust as one of my usual monthly recap posts! And, tonight is our first playoff game, so it will be a double-post day too! Even Scott seems to have a lot of his plate – as you’ll see below, his “Scott Says” interview is even more terse than usual (is that even possible?)! So, Rex is 20 months and the biggest thing that’s happened this last month is that he has graduated to a big boy bed. And not only is he in a big boy (twin) bed, but he is also now sharing a room with Landri (Ty will hopefully be moving into his old room/crib soon)! They’ve spent 4 nights together now and it seems like he’s getting bolder and bolder. The first few nights he stayed put in his bed until I came to get him in the morning. It was almost like he thought he was supposed to stay in bed just like he used to in his crib in his old room. But last night, when looking for Rex on the monitor, I realized he was gone!! And since about two nights earlier, he had fallen out of bed and then asleep on the wood floor, I thought I better go check. Well, wouldn’t you know! 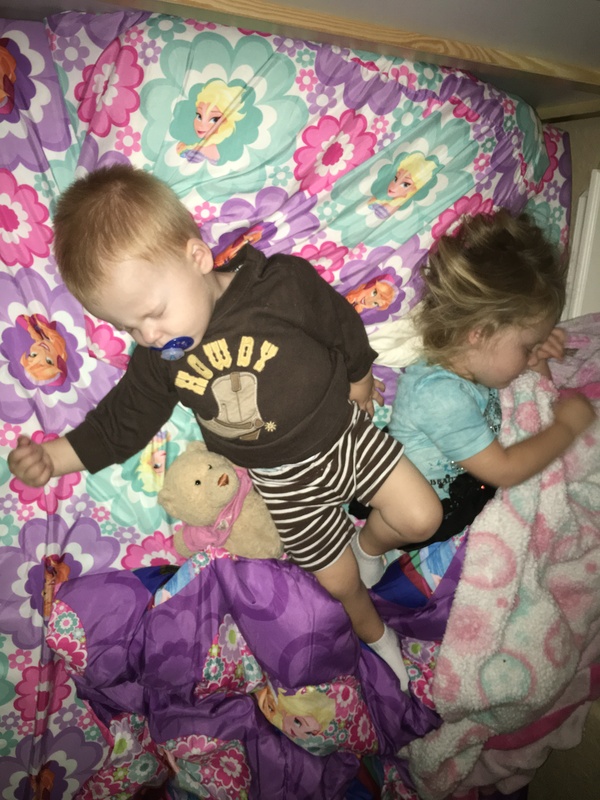 He had climbed into bed with Landri and they were cuddled up asleep together. I raced downstairs to get my phone to snap a pic. When the flash went off, it disturbed Landri and she moved away from him so I didn’t capture their sweet cuddle. But it’s still a cute pic! Rex said his first real sentence which was “Let it go” (thanks, Frozen). He also says stuff like, “I want more” (food). He knows Landri’s Barbies names too, which totally cracks me up! And he randomly will say, “Ay, Chihuahua,” which is also hilarious. Rex is quite possibly one of the cutest humans on earth. There’s something about him when he’s wearing his jeans and boots that just steals my heart. And he’s also quite possibly one of the grossest humans on earth. He’s always a mess and getting into things. He even managed to contract Hand, Foot, Mouth this past month (along with a few other bugs)! He keeps us on our toes, that’s for sure! I found him standing on our kitchen table the other day. You literally cannot turn your back on him! M: Tell me a little bit about Rex William Lehnhoff. S: No, I’m not doing this. M: Tell me about Rex William! S: I don’t know. There’s a lot of funny stuff? S: He’s a happy little guy. M: Give me three adjectives to describe Rex. M: What makes Rex happy? S: Everything. He is my son! Geez! Quick poll… His hair is getting long and needs a trim. Should we let it grow out during playoffs or just buzz it off? Scott wants to buzz it short, and I’m impartial I think. Previous Post District Champs: Knights Score Perfect Regular Season, 10-0! Next Post Knights Win 1st 2015 Round!